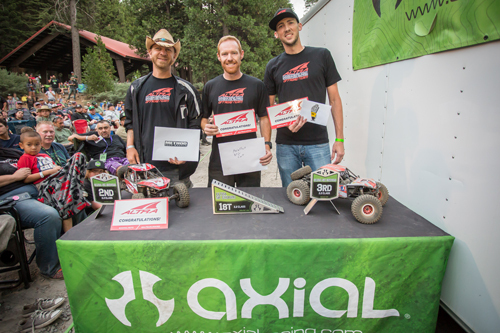 Only online registration attendees receive the event t-shirt and driver bag! 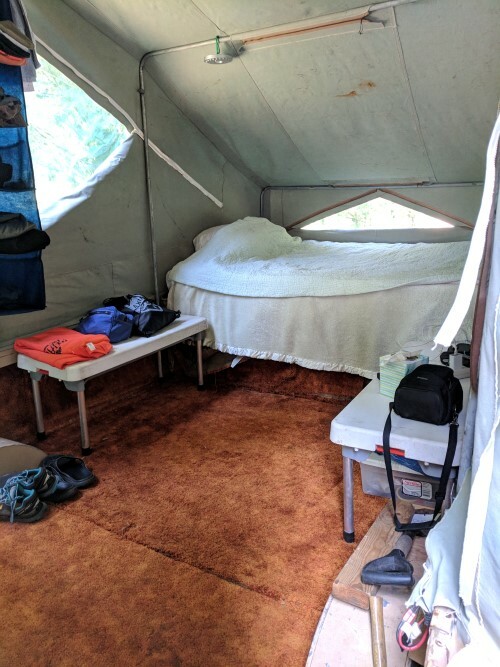 Online registration ends June 7th, 2019 at 12:00pm. 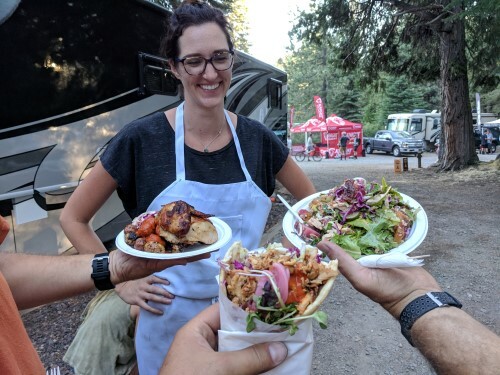 On-site registration ends July 27, 2019 at 10am. 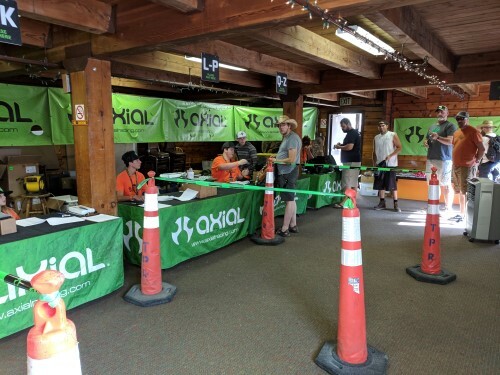 ALL AXIALFEST ATTENDEES MUST COMPLETE AND SIGN A WAIVER. 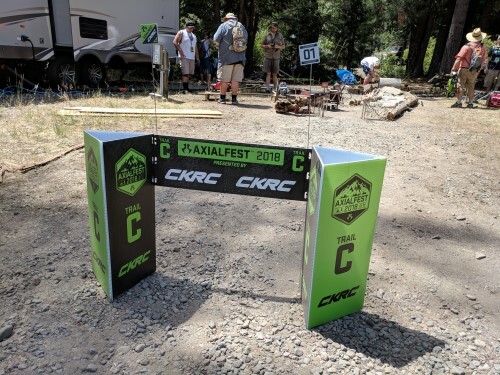 Please download and print the waiver, fill out the necessary information, and bring the waiver to Axialfest to hand over at check in. 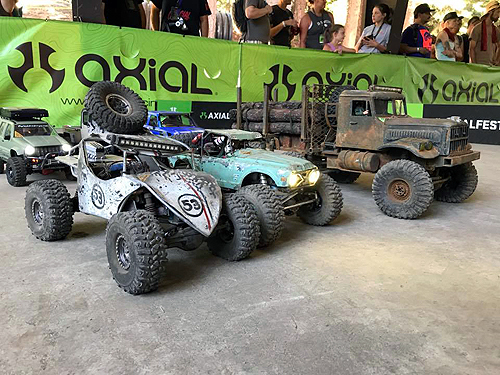 The Rock Racing event at Axialfest is a fast paced and challenging race open to anyone who attends Axialfest. 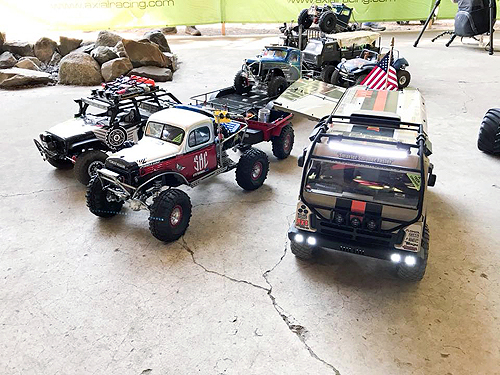 Many prep their rigs specifically for the event and others just arrive for fun. 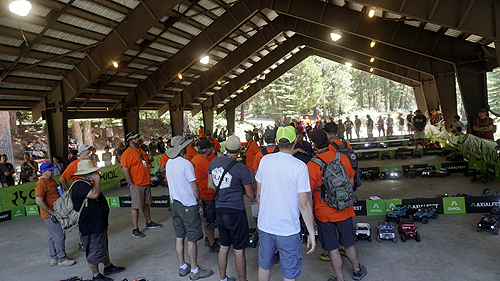 Racers stage in each class for qualifying to narrow the fields. 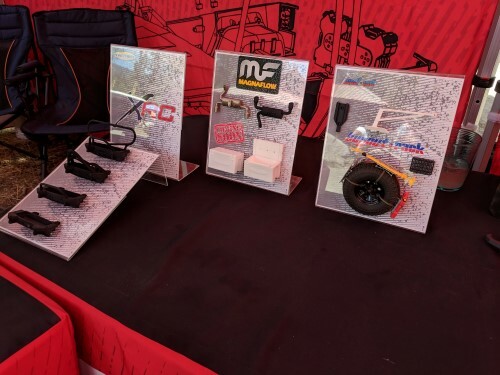 Qualifying however involves strategy as there are no marshals to assist you in roll overs on the course for most of the racing. You flip, you’re done unless you can wiggle your wheels and rip the throttle to right yourself. After qualifying, the field is narrowed up and the mains are run to determine the top three finishers. Here, drivers tend to toss strategy and go for the win. Sometimes this new style of driving works and other times it does not as this year we saw some favorites on their roof early on. 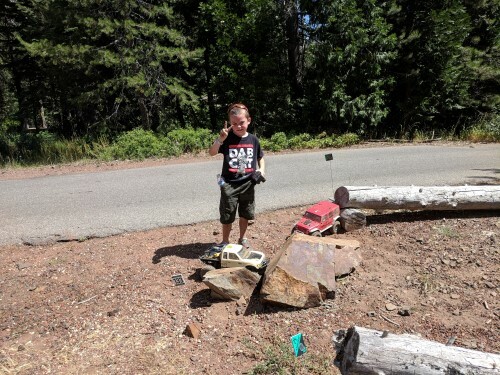 Drivers take on the rock, sand, wood. 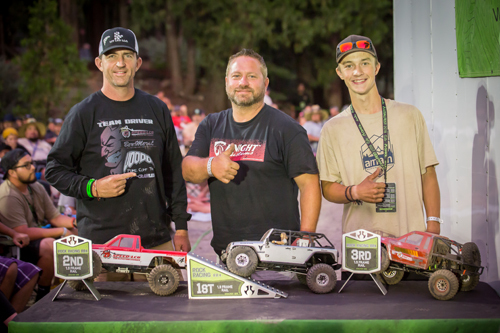 jump and even pinecone littered course for three laps in the main and the following drivers made it to the top to claim their positions at one of the toughest Rock Racing events; Axialfest! 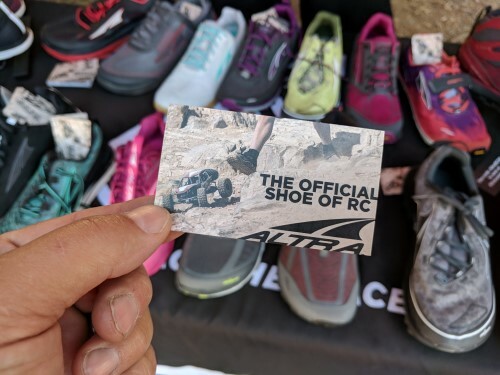 This year’s Ultra 5K was exciting from the start as 62 entrants lined up to compete in the challenge that tests the runners endurance, their rigs durability and ability to navigate the course. 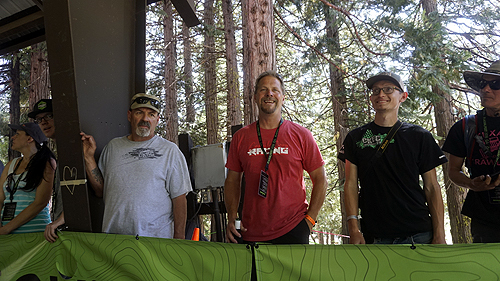 Brad Perry put a lot of work into laying out a challenging course and that it was. 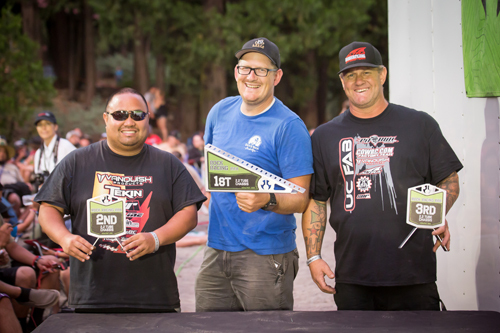 Runners took off two at a time on their own clock to conquer the trails that lined Cisco Grove. 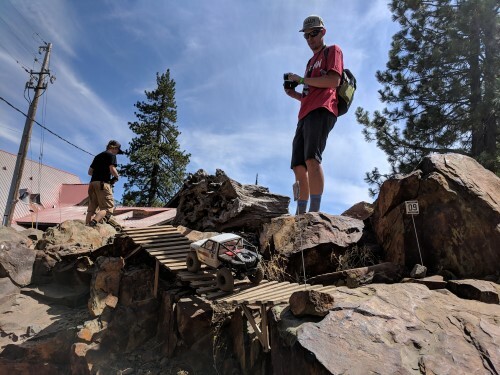 The path had technical challenges that went up hill, through loose dirt, through rocky terrain, past fallen logs and over lots of rough natural terrain. 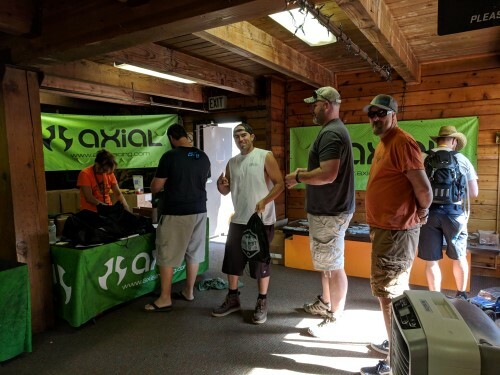 There were a number of dropouts in the race, mainly due to mechanical failure, but most runners kept their hearts in it to say they finished an Axialfest Ultra 5K. In the end, there were some familiar faces on top. 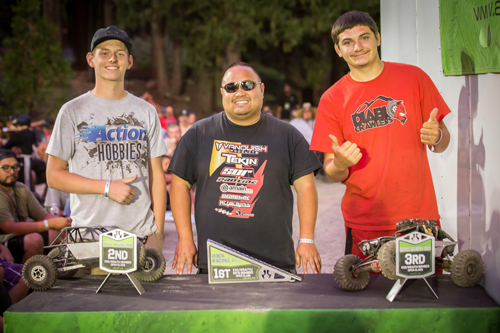 Jake Wright took home the win ahead of Mike Thompson who just grabbed the second place podium spot thirty seconds in front of third place Chris Jones. 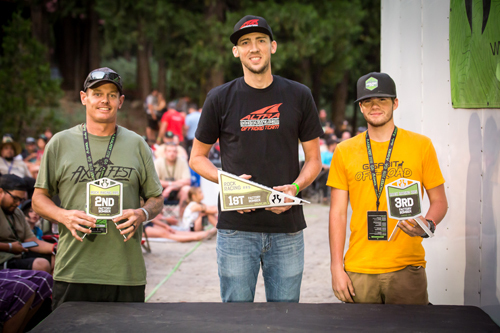 The top three all sported Altra Running gear to help them to their victory. 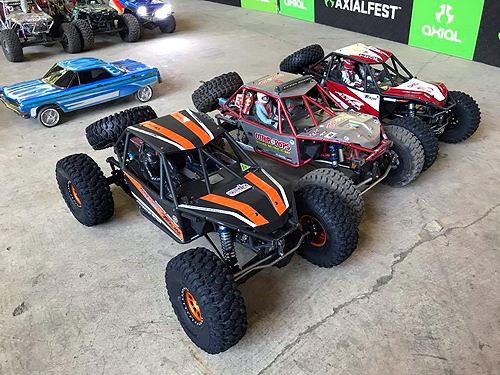 Think you can take on the racing events at Axialfest? 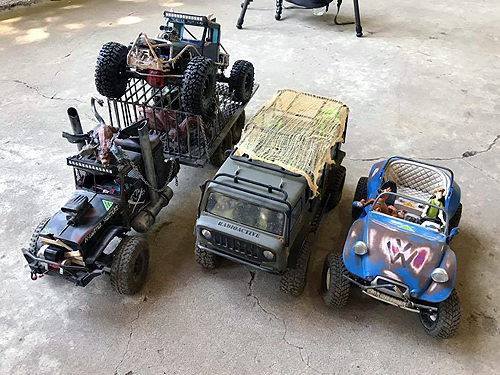 Start prepparing now and we’ll see you at Axialfest 2019! 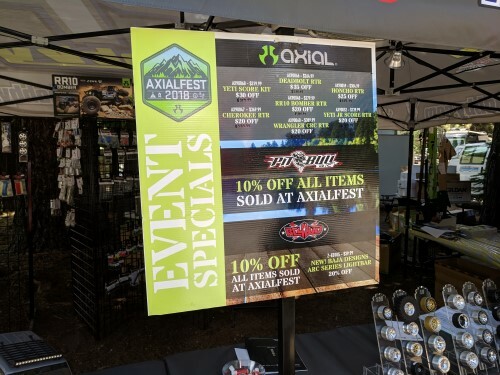 You know what July means, Axialfest! 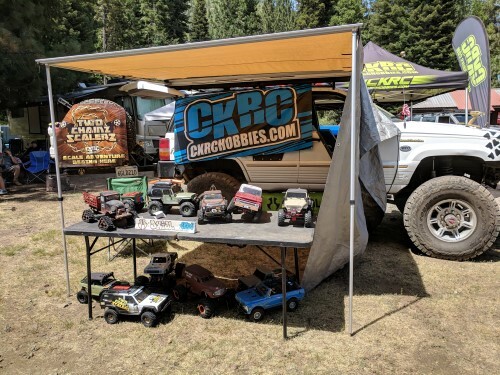 That’s right, the largest gathering of scale RC fans at Cisco Grove Campground. 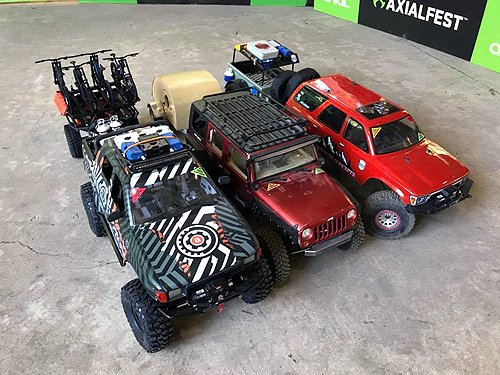 Follow along as I give you a small sample of what went down at Axialfest 2018. 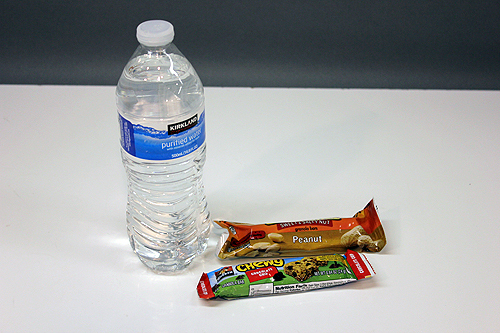 Part 1 of the Skeeno Report will cover what I saw on Wednesday, July 18. 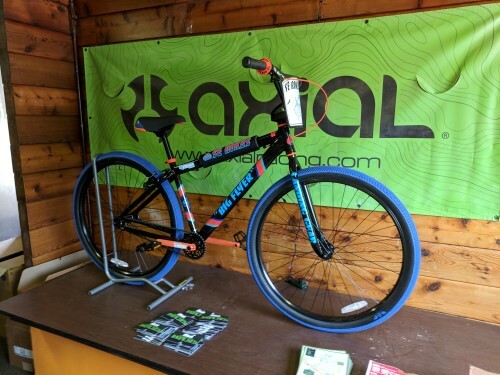 As usual, you have to stop at the store when you arrive at Axialfest. 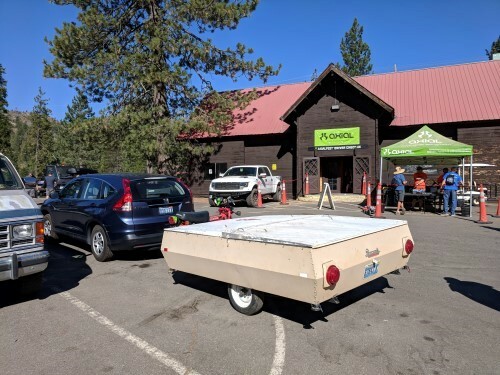 This year was a little different though, because before you went to the store, you had to stop at registration on the opposite side of the street. First Axial staffer I ran into was Stinky Shawn Barton. 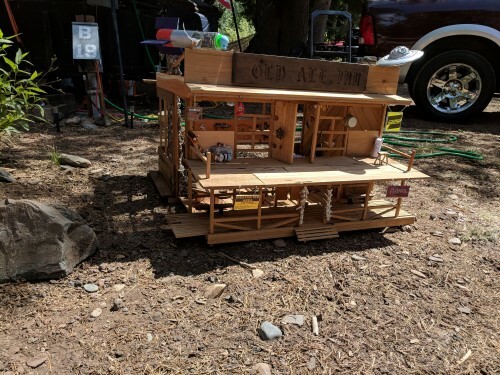 He was up at Cisco Grove for four weeks getting ready for all the Axialfesters to arrive. 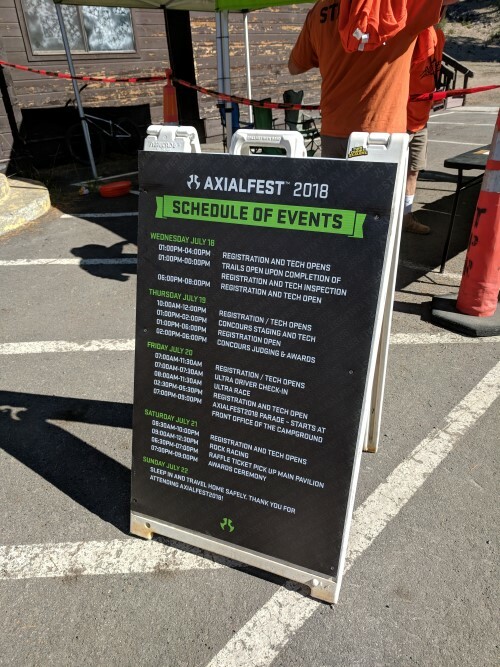 Looks like a full schedule of fun at Axialfest 2018. 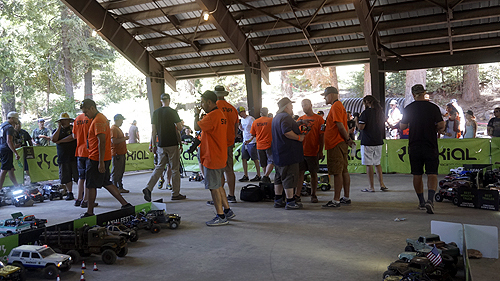 Before going in to the registration building, you got to get all your Axial vehicles teched by some of the Axial staff. Randal Davis and Scott Kerkes were manning the tech booth when I arrived. 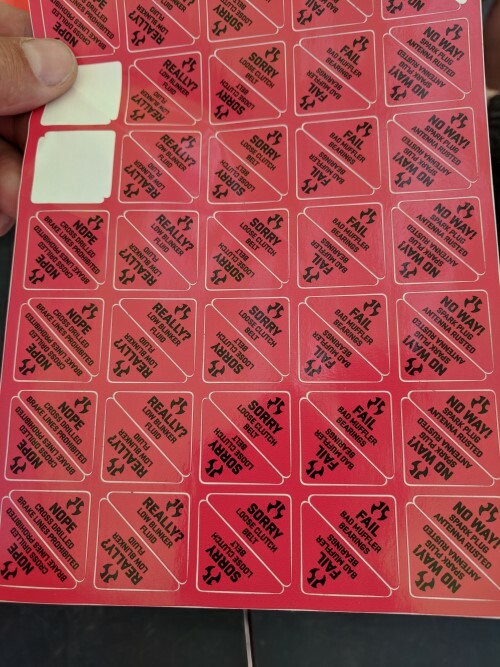 If you passed tech, you got one of these stickers. 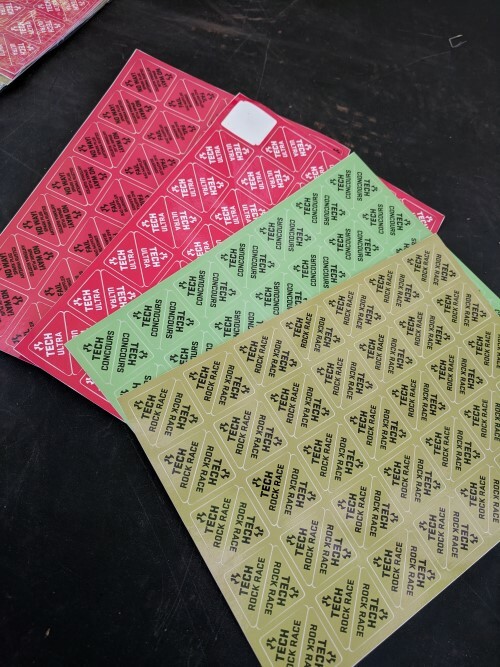 If you failed tech, you got one of these stickers. 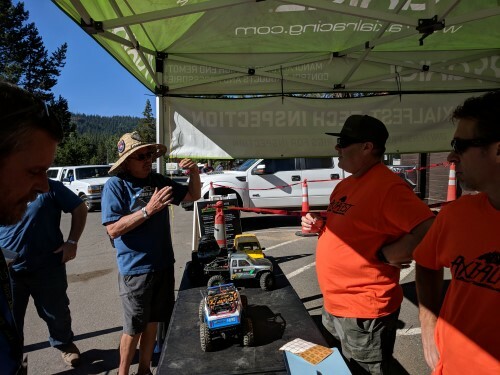 At the tech booth, RC legend Don Hughes was arguing with Matt Kearney about which brand of muffler bearings were the best. 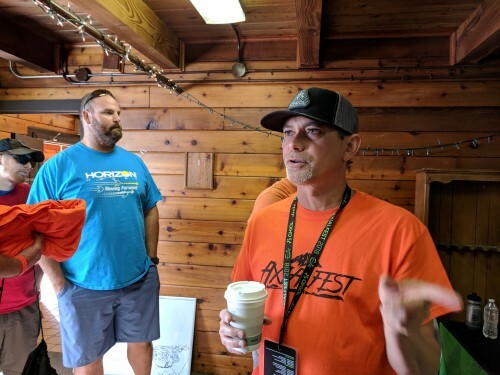 Inside the registration building, Jeff Johns was happily pointing to the swamp cooler that was keeping the registration staff nice and cool all day long. There were cones and tape for traffic control, but I don’t think there were ever very big lines. The new check-in system really seemed to smooth out the process since it was open all day, everyday. I saw one chain of 2ChainzScalerz, Adam Dean, aka G Eazy checking in and getting his swag bag, shirt, hat, waterbottle, etc. 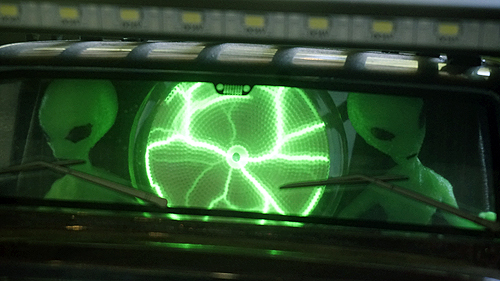 Can you see the swamp cooler in the corner of the picture? Ohhhhh, sweetness! a PK Ripper. 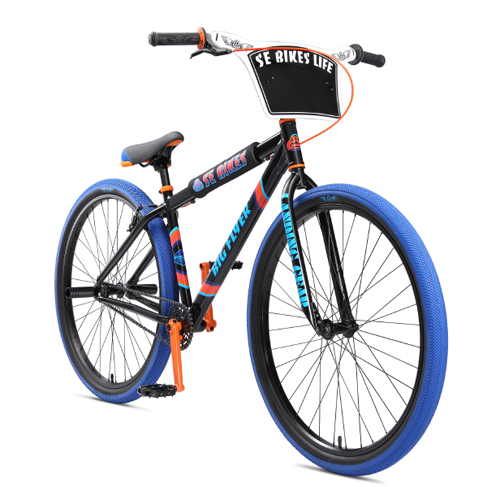 This bike was on my wish list as a kid. 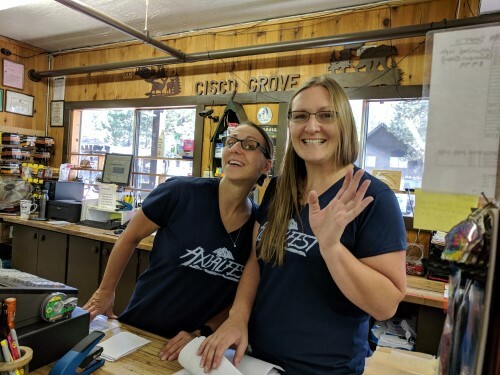 Over at the camp store, the ladies told me that the campground was again sold out this year. 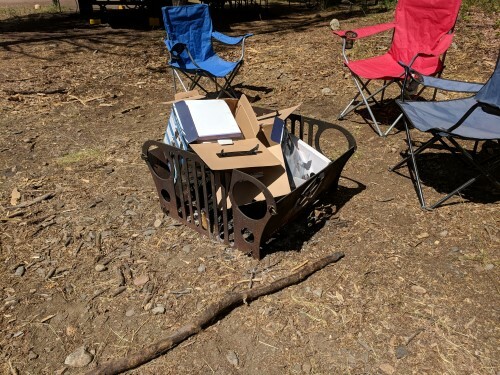 That’s 450 campspots! 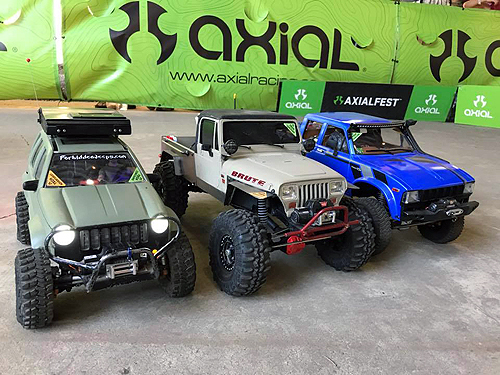 Axialfest 2018 was set to be off the chain once again. 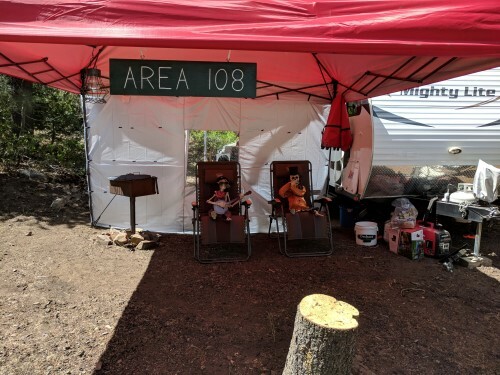 After checking in, we headed over to H30, the Skeeno Spot since Axialfest 2013. 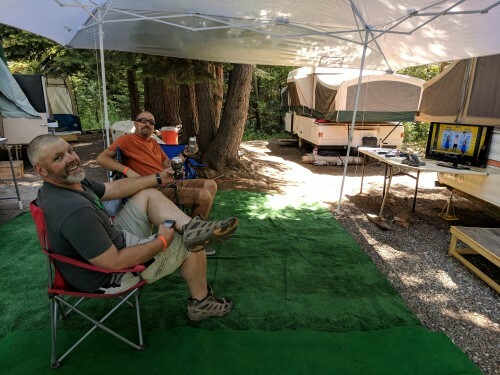 This year we jammed 3 tent trailers and 2 canopies into our spot. Nothing fancy, but the orange shag sure is nice to stand on once the Altra Lone Peaks come off after a long day of walking. Tree, Mike, and I took little break after setting up camp before heading down to check out Vendor’s row. 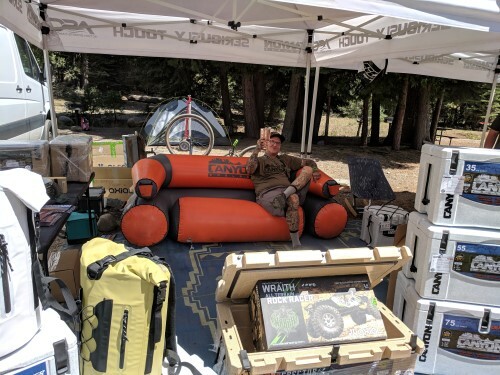 Mike brought a TV, but didn’t get to watch it much, because there’s too much to do at Axialfest. 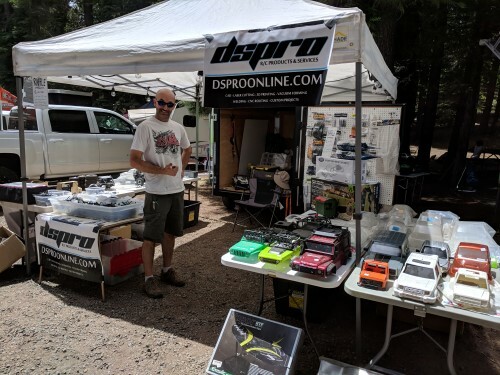 Ryan Gerrish of DS Pro had some screaming deals on bodies and hard to find parts. I got a Glitch Buster for $1! 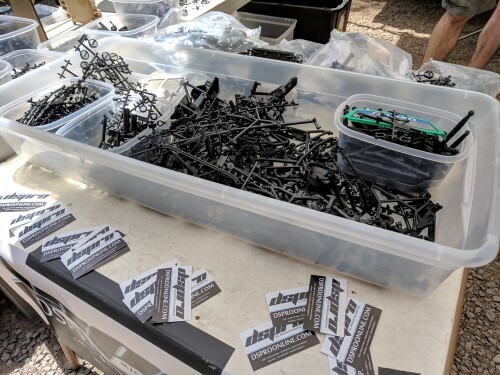 This was box of random Axial plastics. It was all free. 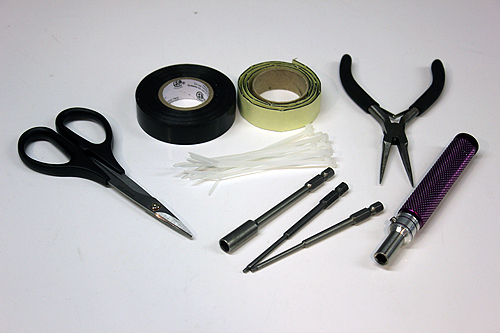 If you broke a part, you could rummage through and find what you needed to get back on trail. MIP came out this year with Matt Olson. 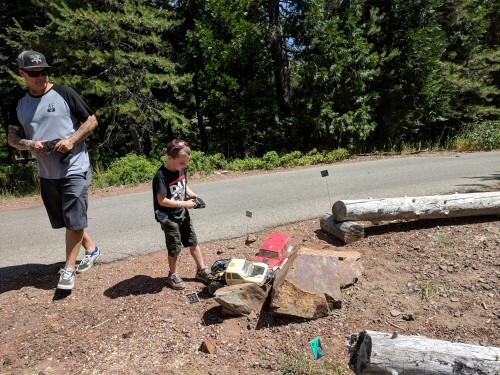 We reminisced about our old favorite RC mag, Xtreme RC cars. 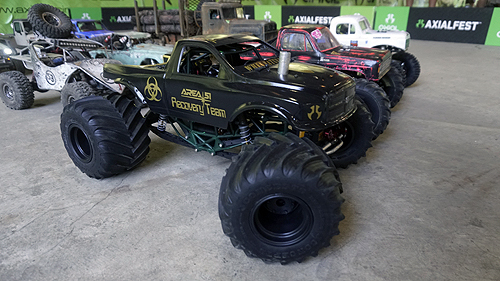 MIP had this racer on display. I’m not sure what it was, but it was HUGE! A Main Hobbies was back with TONS of goodies. 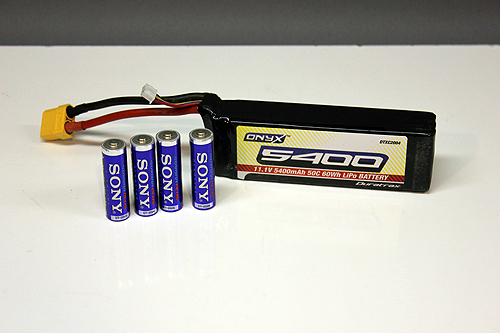 Do you need some scale accessories? 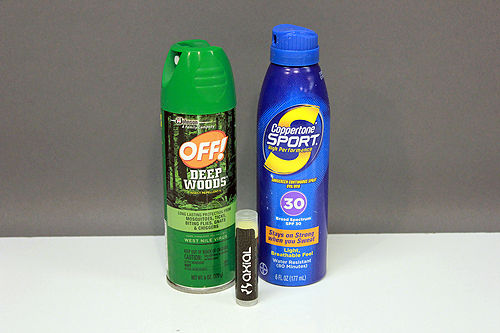 A Main Hobbies has you covered. I see WERTYMADE, SBC, and CBE in there. 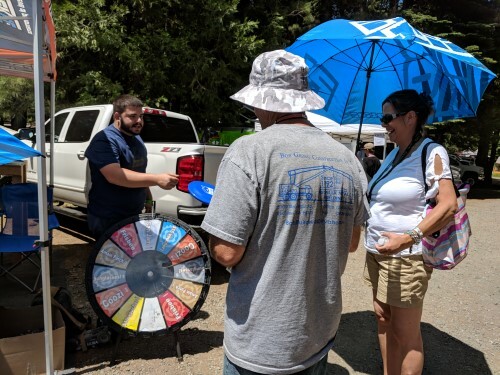 They had a Wheel of Fortune to spin to win prizes. 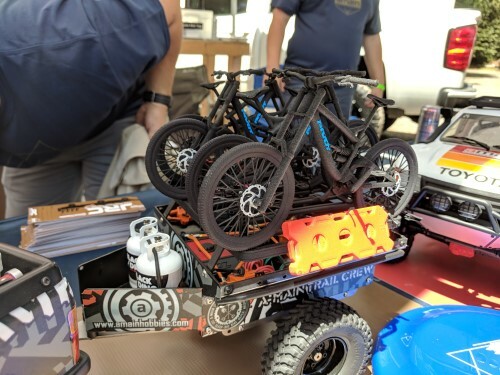 A Main again had a sweet custom build on display. 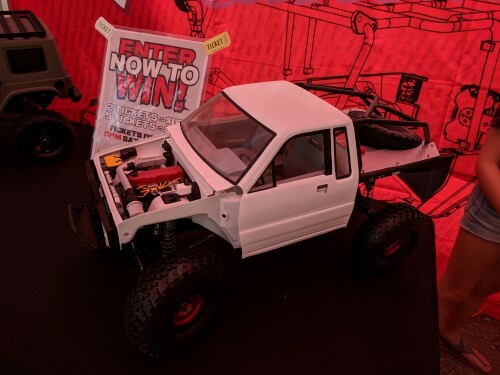 If I’m not mistaken, this was given away on the last day of Axialfest 2018. I’m not sure if those are Pivot Phoenixes or Fire birds, but it doesn’t matter. 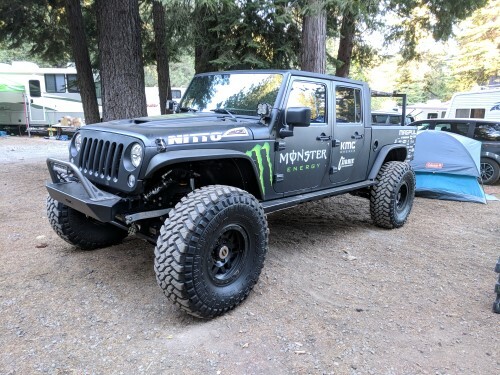 Those Knights Customs parts really complete this build. 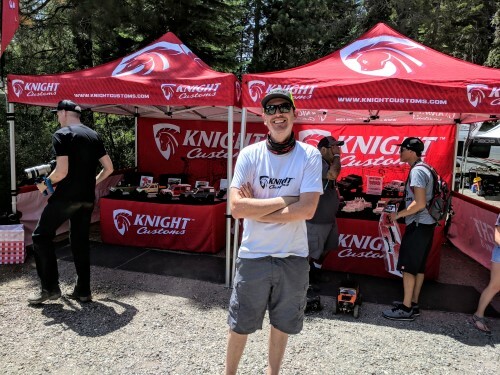 Speaking of Knights Customs, James Knight was back out with his amazing 3D printed goodness. 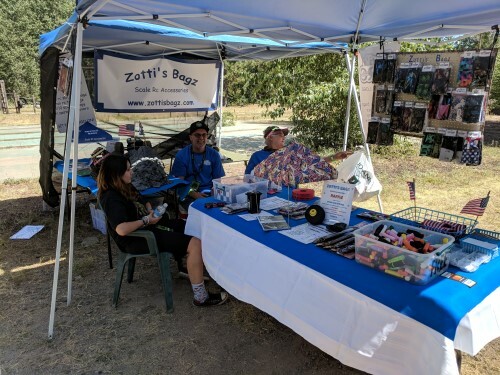 His booth is alway filled with the coolest accessories. 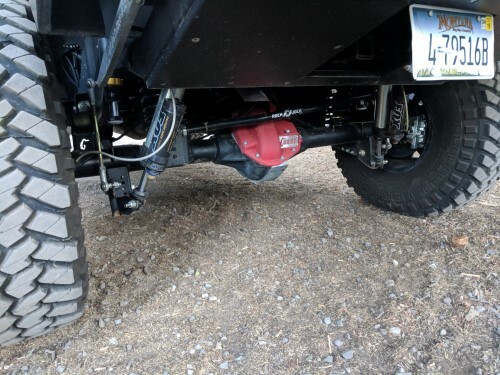 3D printed metal bumpers, exhausts and Pull Pals? Yup, Knights Customs has them. 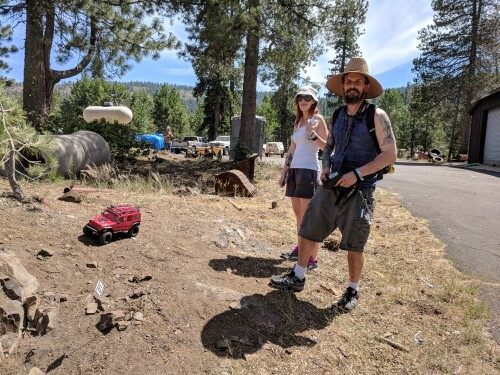 Do you see the scale Canyon Cooler? 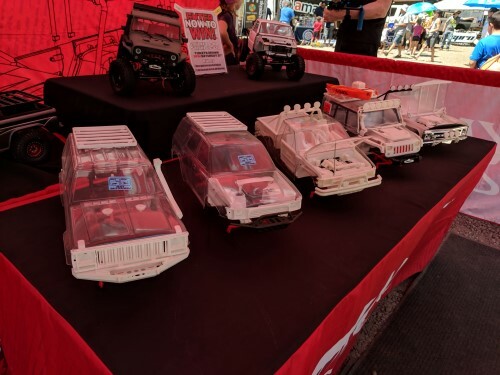 They were Axialfest exclusives. Did you get one? I did. Hemistorm had his build on display. Pictures don’t do it justice. The ‘ghost’ bodies were my favorite part. 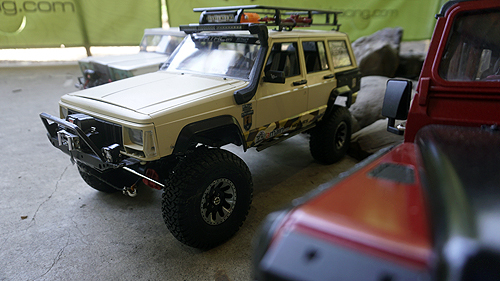 I love the way you can see how all the parts mount up in the stock bodies. 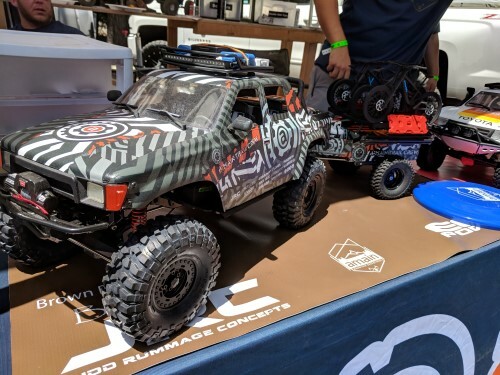 Look how freaking awesome that 22R sits in this Toyota Honcho. PS, this was a raffle item. See the tickets in the background? 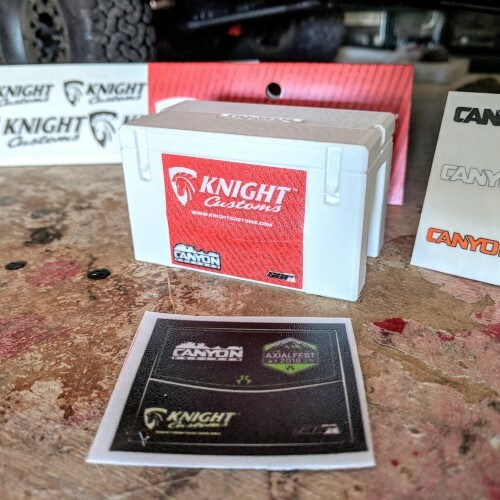 Here’s my sweet Knights Customs Canyon Cooler. I think it’s going on the Jeep. Did you get one? 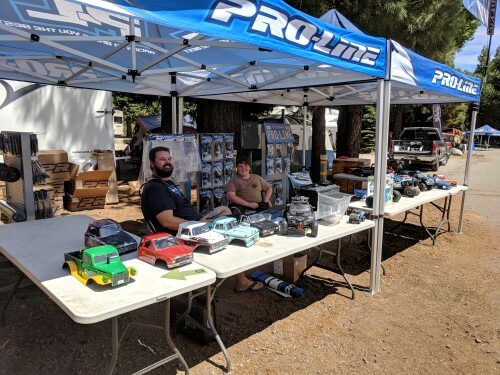 Of course, Pro-Line was there. 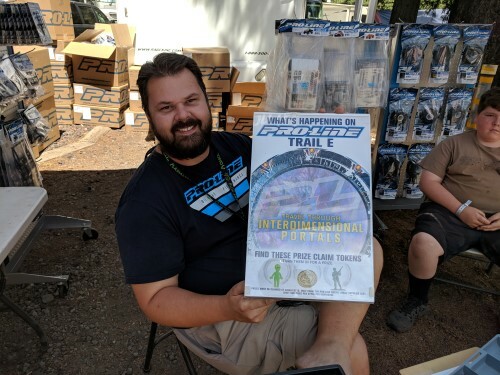 Paul Willhite told me to look for tokens out on Trail E. They could be turned in for prizes at the Pro-Line booth. Hatfields and McCoys. Budweiser and Coors. Red and Blue. Yes, it’s true. 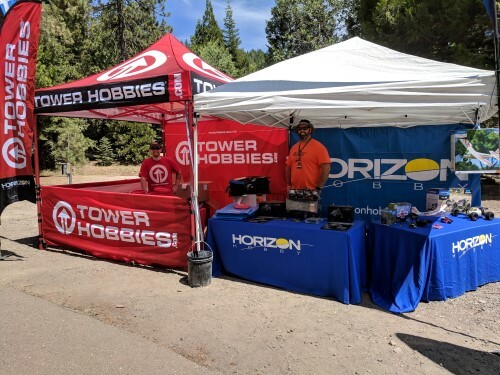 Tower Hobbies was bought by Horizon Hobby and the once fierce rivals are now a team. 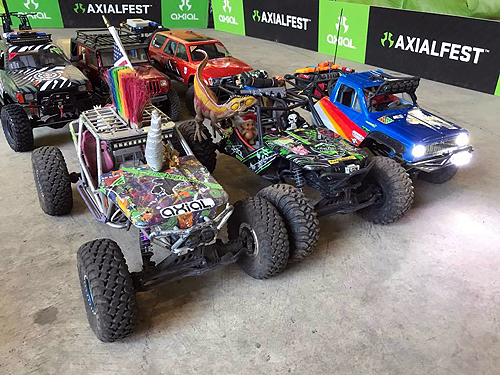 Have no fear, they announced that Axialfest will live on. 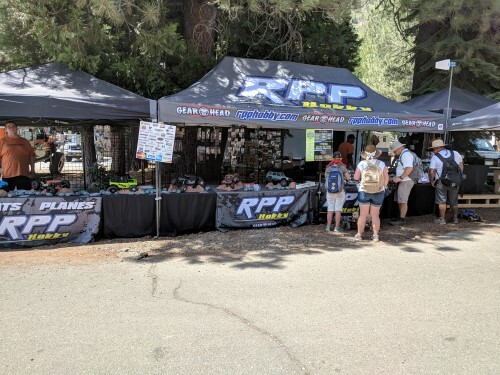 The official hobby shop of Axialfest, RPP Hobby was again packed and ready to meet your needs. They brought all the sweet deals with them. 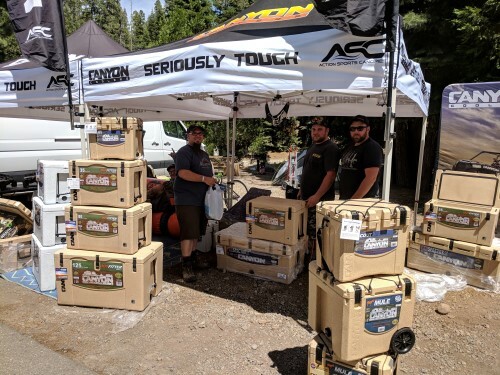 The best coolers to keep your perishables cold at Axialfest, Canyon Coolers was back. 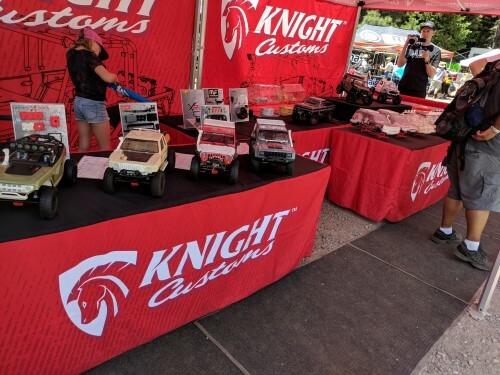 Did I mention Knights Customs has a scale replica? Hemistorm was manning the Castle booth. 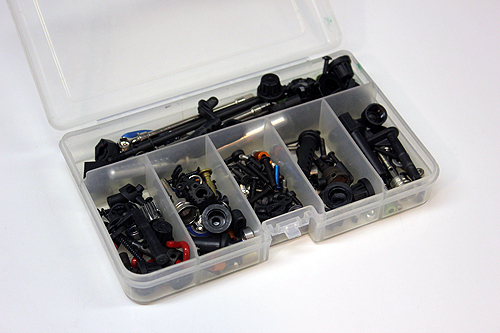 Did you know Castle now has sensored brushless systems? I stopped by to see my old friends at CKRC. 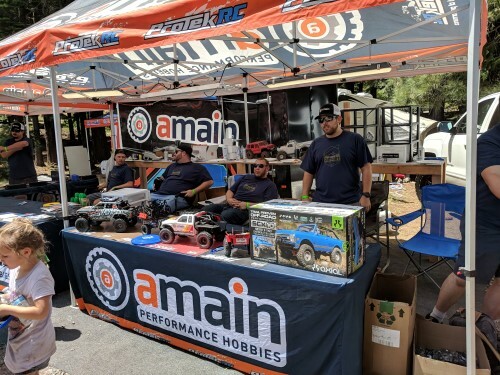 Yes, it’s true that they decided to close up shop and follow a new career path, but that didn’t stop them from coming out and having fun at Axialfest. 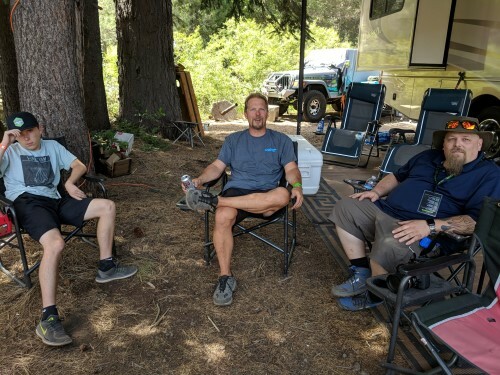 Here former owner, Jason chats with the Taz, Tristan Judkins and Half Link about his next adventure in life. 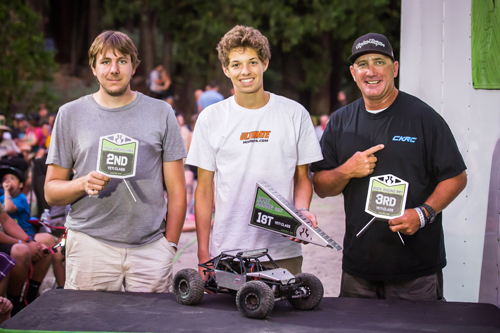 CKRC even had their own trail. The first part was a 2Chainz Skillz section. Of course, it was detailed with cool scale buildings and such. It looked easier than it was. We’ll come back later and try it out. Of course, I had to stop and make Grumpy Fast Eddie yell at me. Sadly, he wasn’t around, so I took the opportunity to totally violate his lawn. All my bearings will probably seize when he sees this picture. 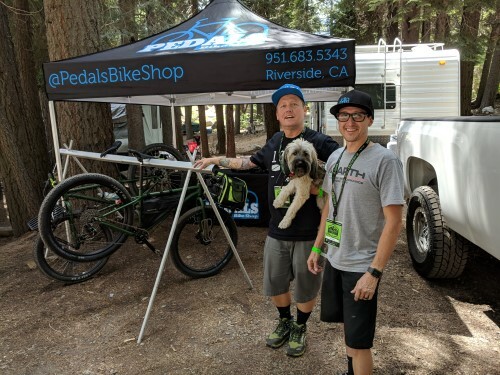 Pedals Bikeshop was back.. 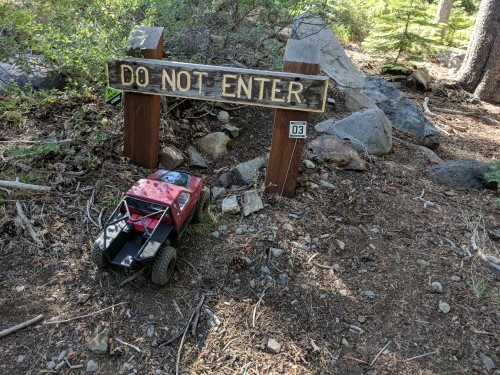 I tried to get them to give me that PK Ripper, but I got denied. I did get a new PBS t-shirt, though. Over at Area 108, these skeletons were having a good time pickin’ and grinnin’ on the old banjo. 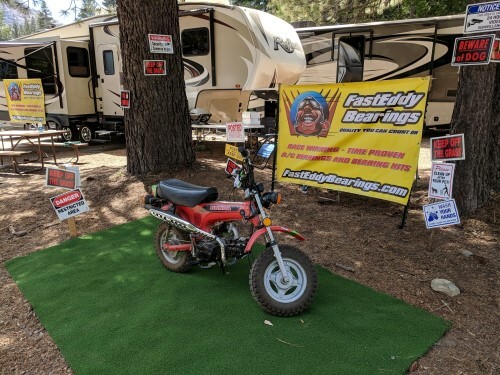 I took a spin around campground to check out who was here and found lots of people already out running the trails. 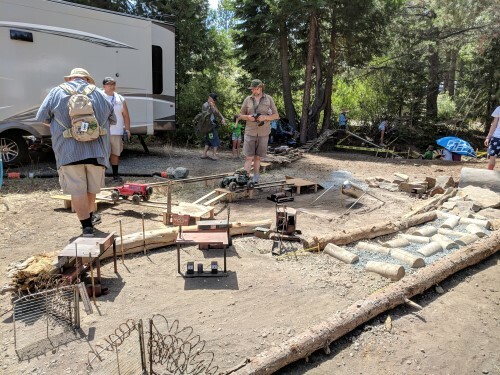 The bridge up front by the camp store is always a fun place to play. 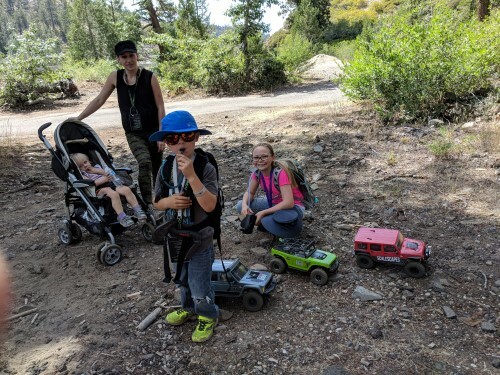 Lots of kiddos were out and about this year again. This guy was smart and remembered to stay hydrated when out in the heat. This little guy was totally focused on driving. I had a hard time getting his attention. He finally threw up the deuces. 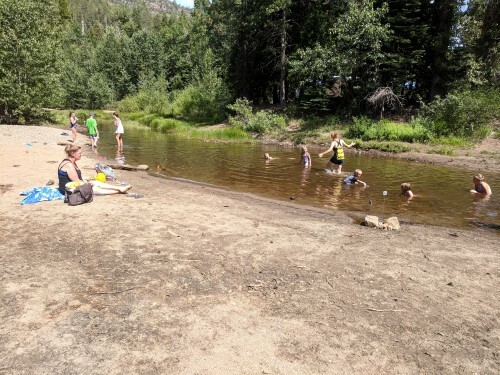 The water was low, but I still saw lots of little ones out cooling off in between driving the trails. 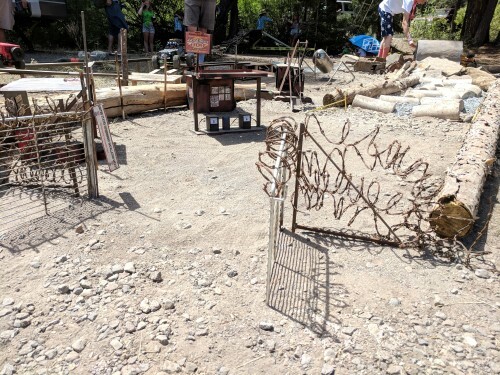 I spotted this cool fire pit on my way out of the creek bottom. There were little surprise buildings all over the place. I’m sure I missed a bunch. How many did you see? 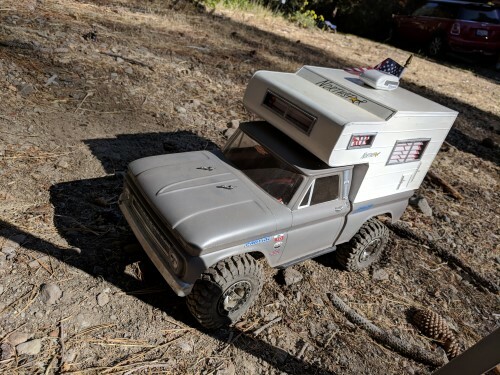 The 1:1 SCX10 was back again. Last year Mrs. Zotti was over in A section all by her lonesome. 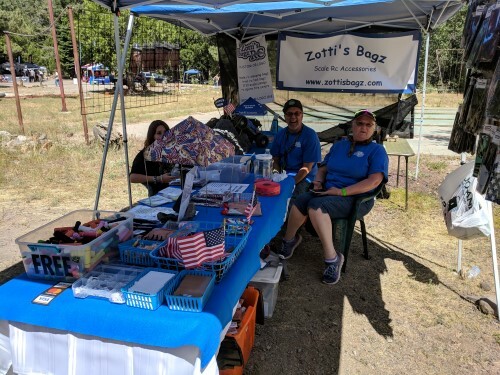 This year she brought all her fun bags and canopies over to Vendor’s Row. She can customize yours for you. The temps were only supposed to be in the mid-80s, but for some reason it felt WAY hotter. 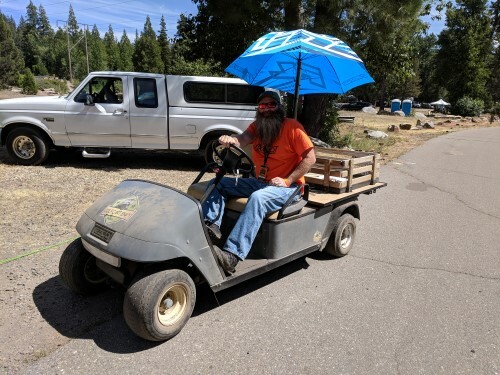 Luckily, Mr. Barton had a little shade to keep cool on his security rounds. What in the what? 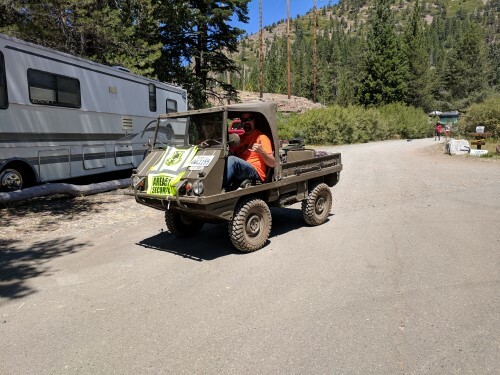 Secret Area 51 Security vehicle. 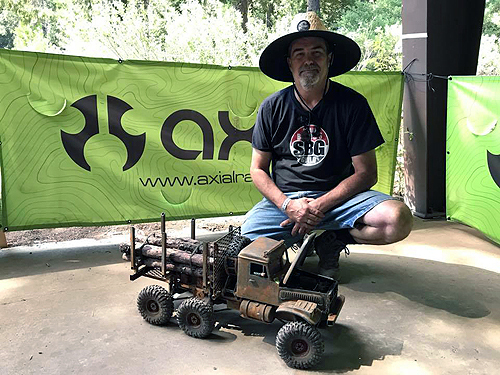 Scott G. brought his Haflinger out to play at Axialfest. The engine looks like someone cut a VW flat 4 in half. 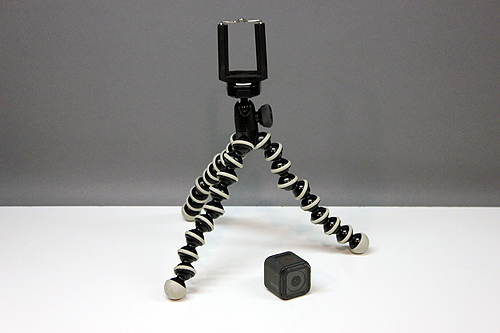 Go check these out, super cool! Big man, little car. Last year Tree putted on my Skeeno Skooter. 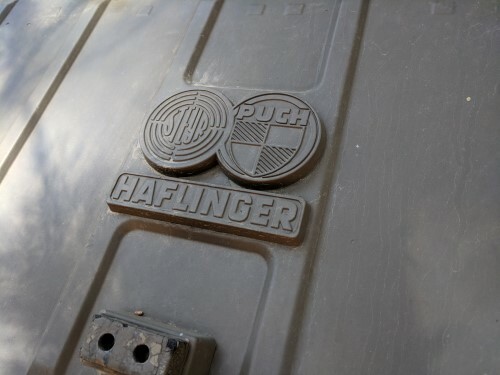 This year he jammed himself into the Haflinger. 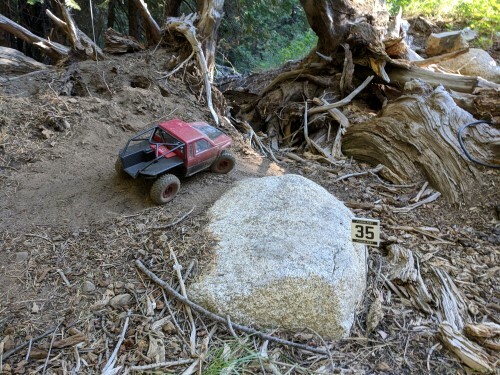 Something crazy happened this year; I actually got to drive my SCX10! Usually, I’m so busy with STAFF duties that I don’t have time. This year I got to hit a few trials. The 2ChainzScalerz course was my first stop. I had to fill up before we headed out. 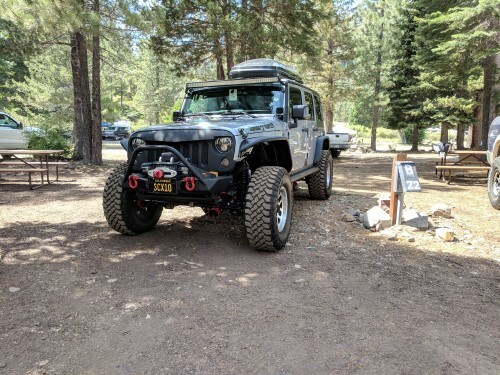 I updated my trail rig this year by going with a Proline Toyota Honcho lid and Axial Nitto Trail Grapplers in the R35 compound. I never obey this sign. 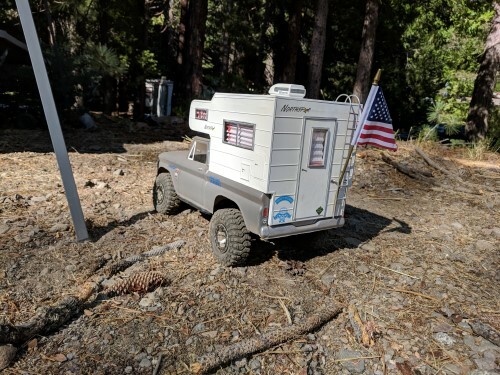 As I was trailing along I spotted this Northstar camper. I looked for the owner, but I think we was taking a nap. Great work whoever built this. 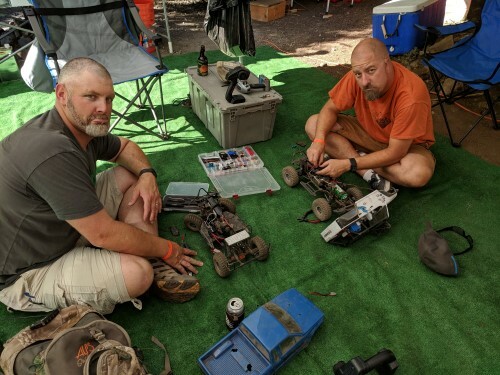 We trailed around a bit more until Tree and Mike had some mechanical issues, so we cut it short and headed back for dinner. 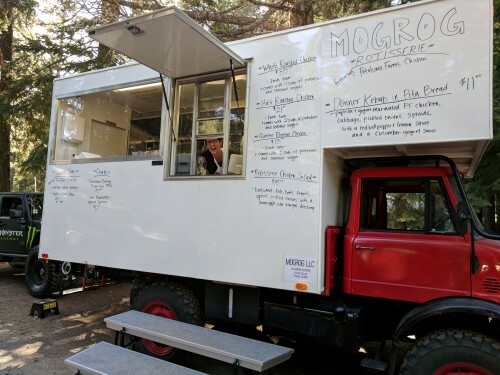 For dinner, we hit up the MOGROG truck. 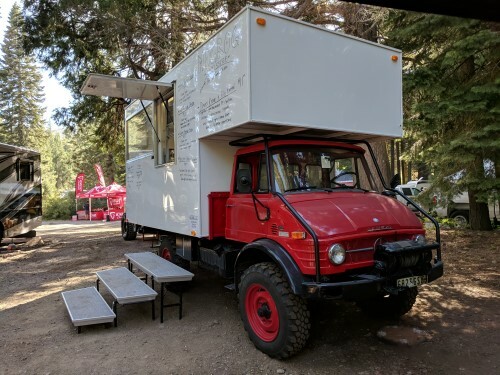 That’s right, Unimog Food Truck. 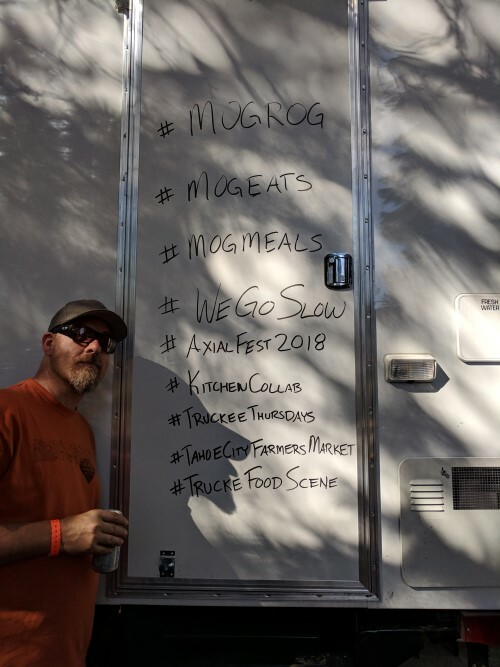 It all sounded good, so we had one of each. It was muy delicioso. 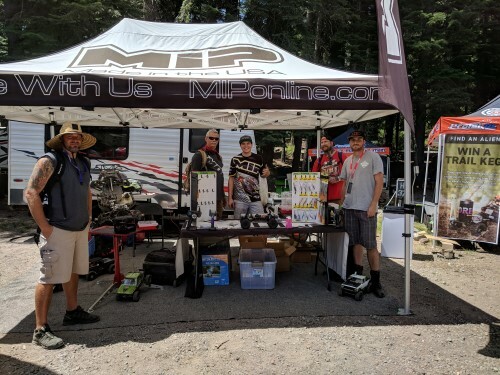 After dinner, the poopy pants boys fixed their rigs, so I went back to Vendor’s Row to see who showed up while I was out trailing. Looks like Casey Currie showed up. 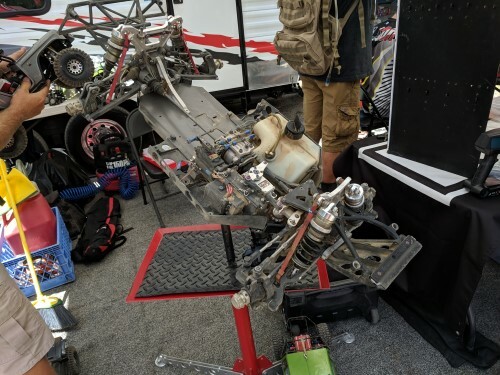 Yup, the axles check out. 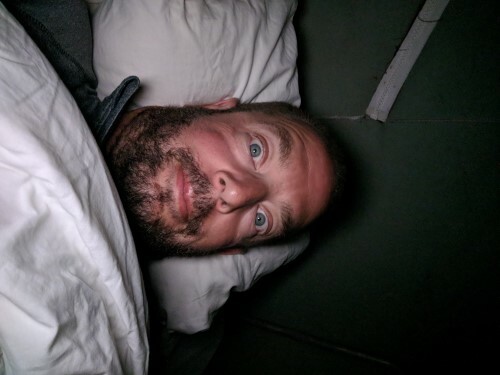 It’s Mr. Monster himself. 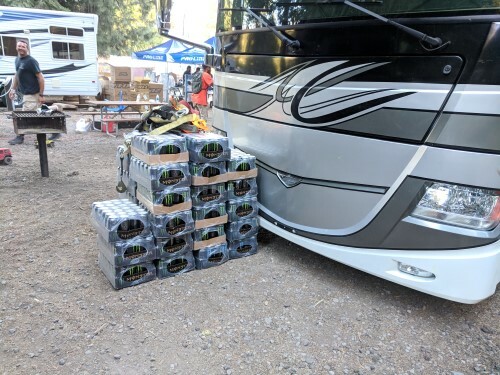 And, he brought enough Monster Energy to keep us going all weekend. 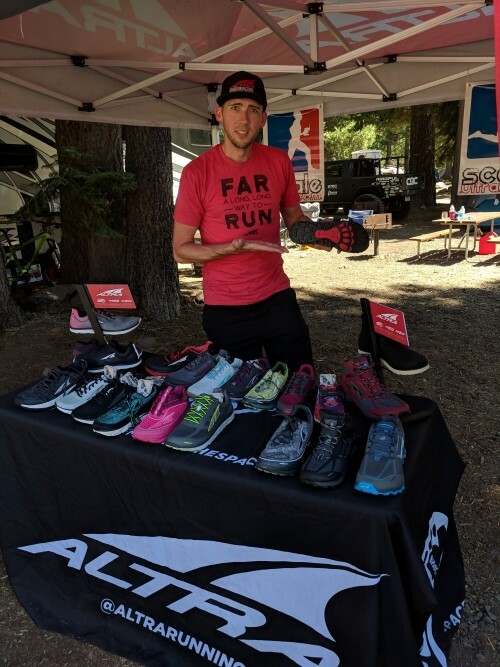 Finally, Mr. Altra, Chris Cru Jones showed up. 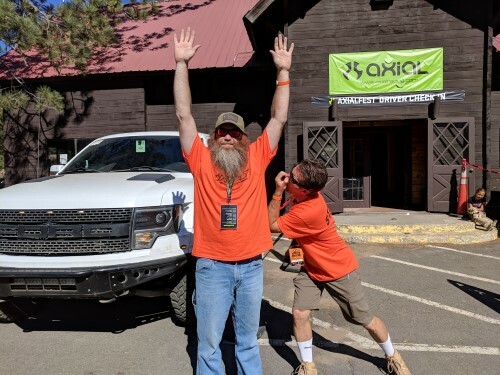 He told me the new Lone Peak 4.0 will be out very soon. 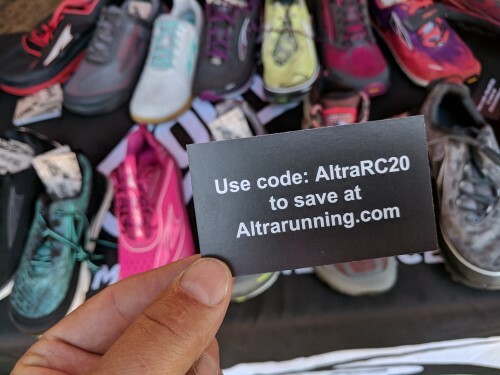 You know Altras are the offcial shoe of RC. And bonus! I get a little discount on my new shoes! 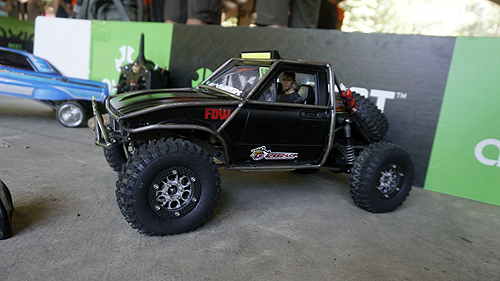 So, that’s what I saw on Day 1 of Axialfest 2018. 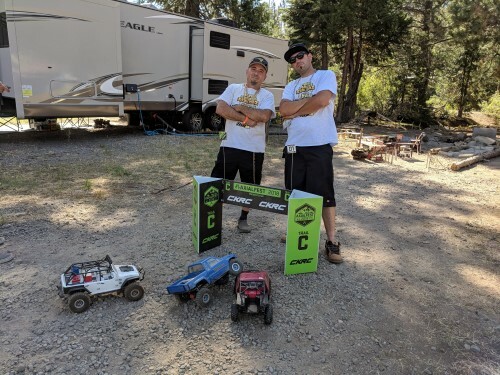 After getting Tree and Mike’s rigs fixed up, we decided to hit the hay and be ready for Thursday at Axialfest 2018. 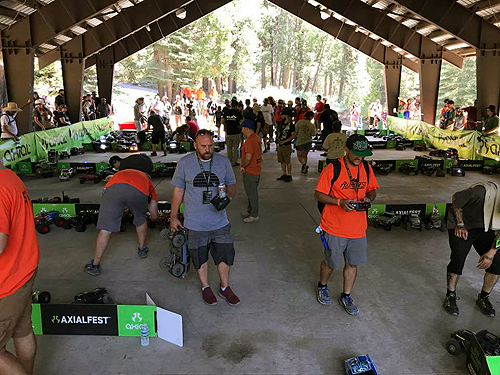 Look for the Axialfest 2018 Skeeno Report Part 2 where I will go over what I saw on Day 2 of Axialfest 2018. 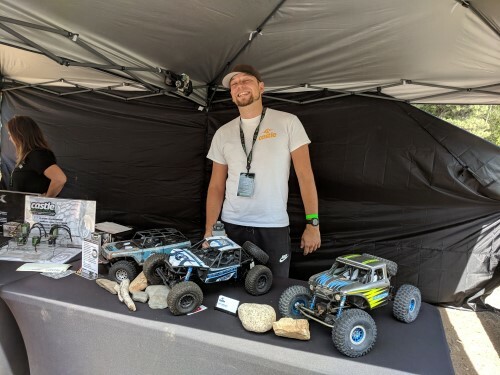 Each and every year, some of the best RC builders converge at Axialfest to put their work on display for Axial fans to see and judges to notice in the Concours event. 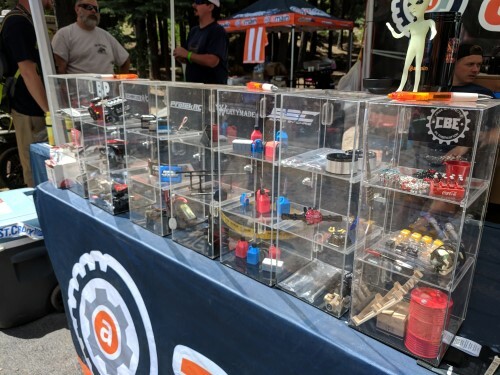 Year after year, more and more spectacular builds line the miniature walls of the Cisco Grove pavilion while bystanders look on as judges stroll pass the presented vehicles looking for machines that really stand out from the rest. 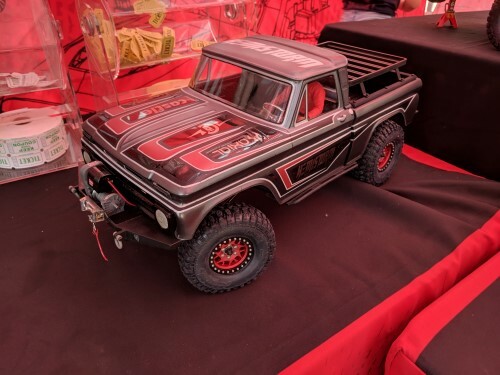 Like previous years, the vehicles on display were all amazing displays of passion for the hobby and representation of some skilled detailers. 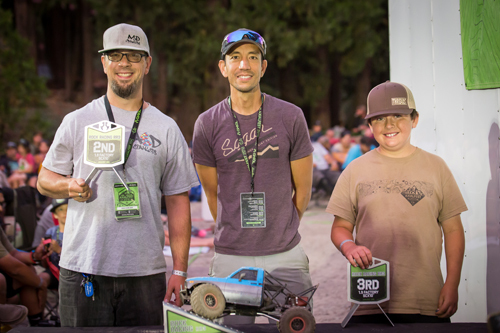 Two new kids classes were introduced into the mix and were supported with some creative builds for their age brackets. 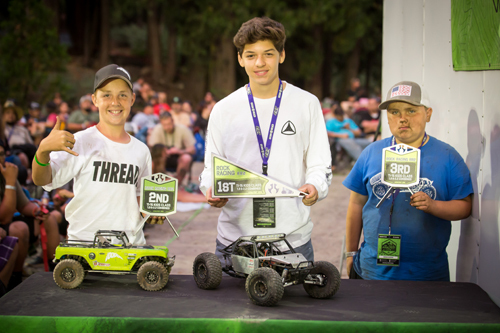 All of those who put their custom built Axial based machines into concours deserve recognition for a job well done, but in the end only three were pulled for awards in each class. 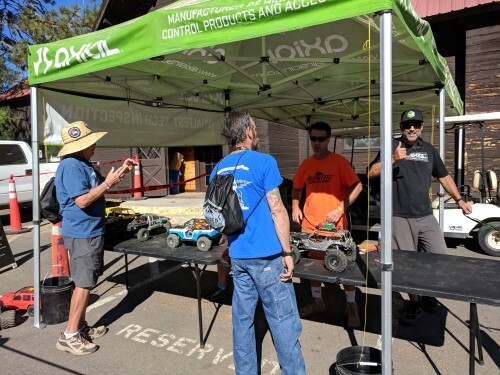 Check out some concourse scenes from Axialfest 2018 and the top three machines for each category. 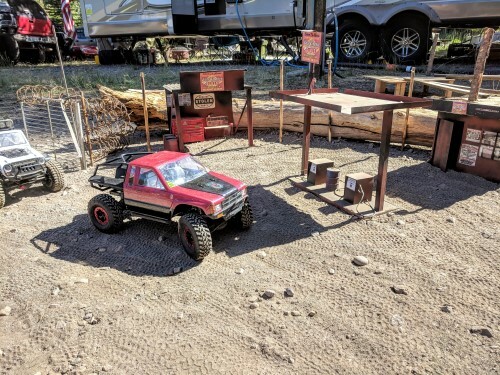 After the Judges had determined the Top 3 finishers for each class, the owners of the trucks were asked to come together and vote on a best of show. 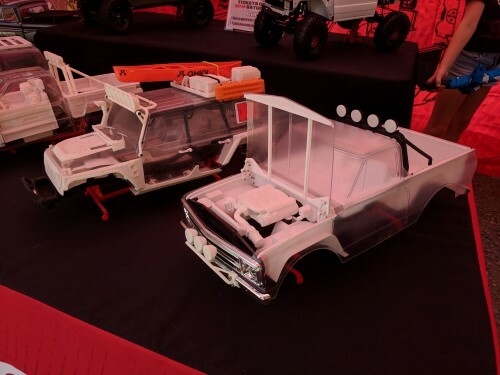 Sure each builder felt their rig was the best, but it was only a short time for them all to come together and agree who was best in show overall. 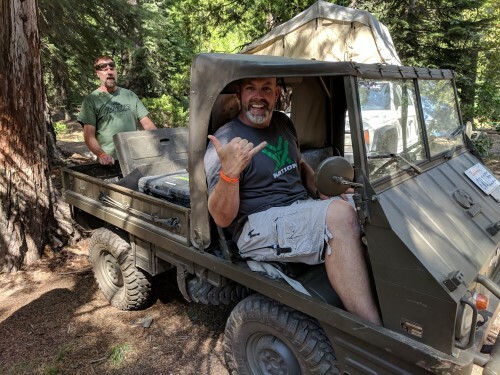 In the end, Todd Norton with his Kraz 255 Converted Ukrainian Military clearly stood out from the rest from it’s detailed body, perfectly scale wood log haul and it’s patina for days. Congratulations for all those who took home awards and thank you to all those who entered. 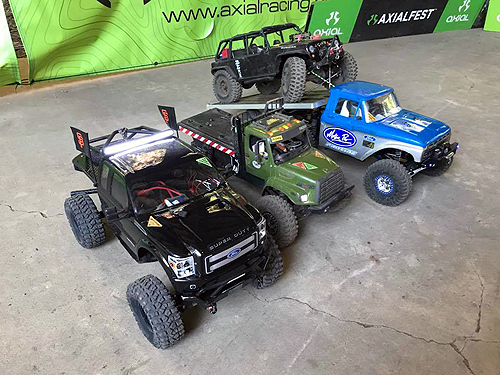 Yet again another Axialfest Concourse event has wrapped up and builders continue to amaze with builds that show off passion for Axial adventure vehicles and beyond. 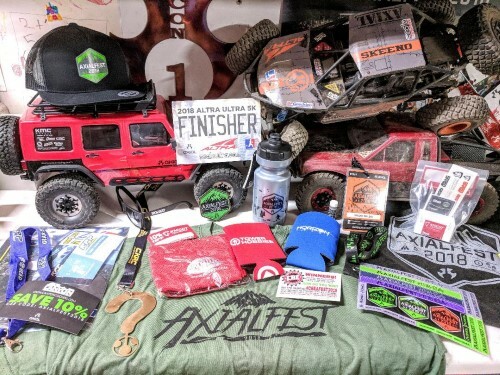 We can’t wait to see what everyone comes up with for AXIALFEST 2019!